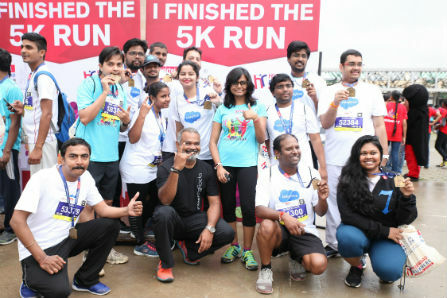 Hyderabad: As Hyderabad gears up for the 7th Edition of Airtel Hyderabad Marathon on 20th August, the sports lovers and enthusiasts are not left behind in the 5K Fun Run that was flagged off today at the Hitex Exhibition Center. Over 6500 runners assembled at the Hitex Exhibition Center at 7:00 am today morning for the 5K Fun Run, which also happened to be a curtain raiser for Hyderabad’s flagship running event, the Airtel Hyderabad Marathon. Celebrating the 7th year of the Airtel Hyderabad Marathon, the organising committee – Hyderabad Runners Society, introduced the 5K Fun Run encouraging children as well as adults running novices to discover the joy of running and also be part of the premier annual event. It also had enthusiastic runners come in colorful costumes and some supporting different social causes.